Reinvesting earnings is a powerful tool that can help investors grow their wealth, thanks to a phenomenon called compounding. 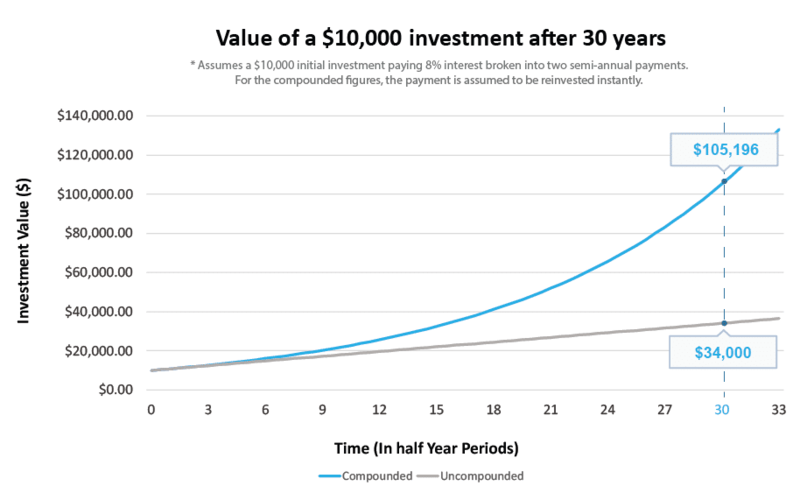 Warren Buffett once said: “My wealth has come from a combination of living in America, some lucky genes, and compound interest.” What is compounding, and why is it so important to investors? Well, we’re going to dig into that here. The simplest way of explaining compounding is that you are making returns on top of your returns. I’ll use a simple example to help clarify: say you make a $10,000 investment into a bond that pays 8% interest, semi-annually, meaning you receive a $400 payment twice a year. Now, if you just took the two $400 payments, and assuming you don’t care about price changes in the bond, your return is 8% per year. Pretty self-explanatory, right? Well, what happens if you reinvest your first interest payment as soon as you receive it? Your investing base (the amount upon which you earn interest) rises from $10,000 to $10,400 for half the year. Now, if we multiply that by 4% (our 8% interest divided by 2 to account for the semi-annual payment), you now earn $416 on your second interest payment. That extra $16 may not seem like all that much, but here’s the difference that reinvesting can make over time: if you were to simply take the interest payments you received, it would take you 25 payments to double your money, or 12.5 years. If you reinvest your earnings, it would only take you 9 years instead. If you had been reinvesting for the same amount of time it took to double your money without reinvesting, you’d have made an extra $6,700! For investors with a long-term investment horizon, those three extra years can add up. With an investment horizon of 30 years, you’d make about 9.5 times your initial investment ($95,196.27 in profit), whereas if you just took the interest out, you’d receive less than 2.5 times what you initially invested ($24,000). Compounding is an incredible tool in an investor’s arsenal for growing their wealth. It’s not just useful to purely income generating investments, but to investments that have occasional cash flows as well. The growth power compounding can provide is why AlphaFlow offers its investors the ability to have not just their repaid principal, but earnings reinvested as well. 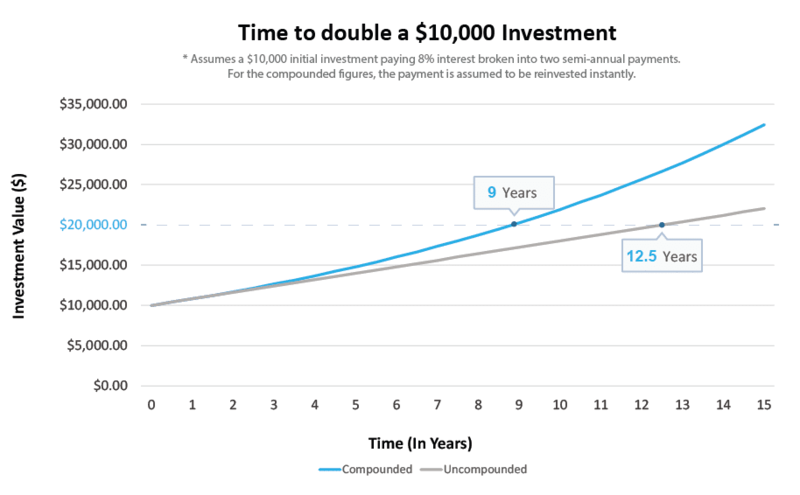 We’ve included a calculator that you can use to see the power of compound interest! 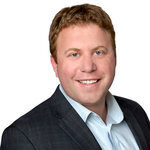 Nick Giovacchini is the Client Services Director at AlphaFlow. 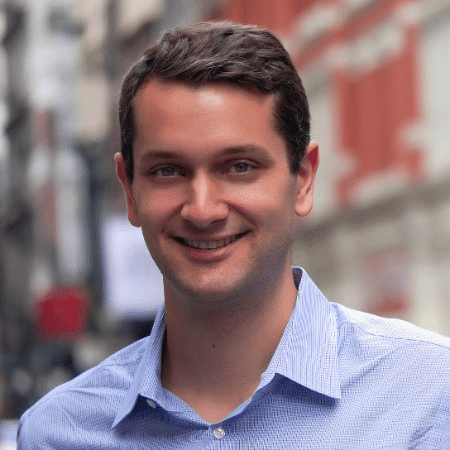 Prior to joining AlphaFlow, Nick worked for Barclays Risk Analytics and Index Solutions team, working with institutional asset managers to analyze risk and performance drivers of their portfolios. He also was an Account Manager for MarketFactory, a leading technology provider for the FX world. Nick has a BA in Political Science from George Washington University in Washington, DC. These loans have been powerful instruments allowing for economic development to a wide variety of businesses for many years. 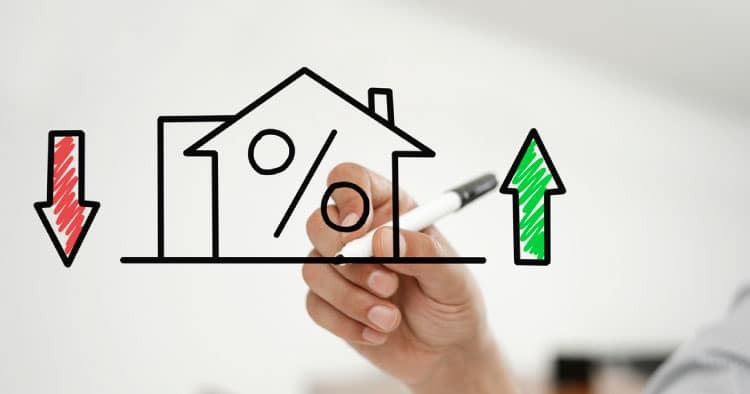 It’s not likely that will change anytime soon, but what is likely is that there will be fluctuation in the demand for basic residential bridge loans in various states, cities, and neighborhoods. That’s because residential property investment is its own business with its own very local cycles. By diversifying into a range of bridge debt, though, investors can reap the rewards of the high-interest rates while opening themselves up to more investment opportunities in any market. Advance your investing knowledge by understanding the tax implications around another investment avenue: real estate crowdfunding. With apologies for the admittedly clickbait title, I’ve got a challenge for you, and I think it’ll make you a better investor. I’ll get to it in just a minute, but first, let me explain why you’re not alone in likely doing this. 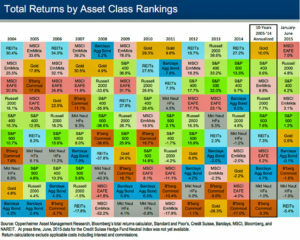 We all hear diversification is great. “It’s one of the fundamental tenets of investing!,” we’re told. However, as we look at many of our own portfolios, we find that it’s not actually a reality. 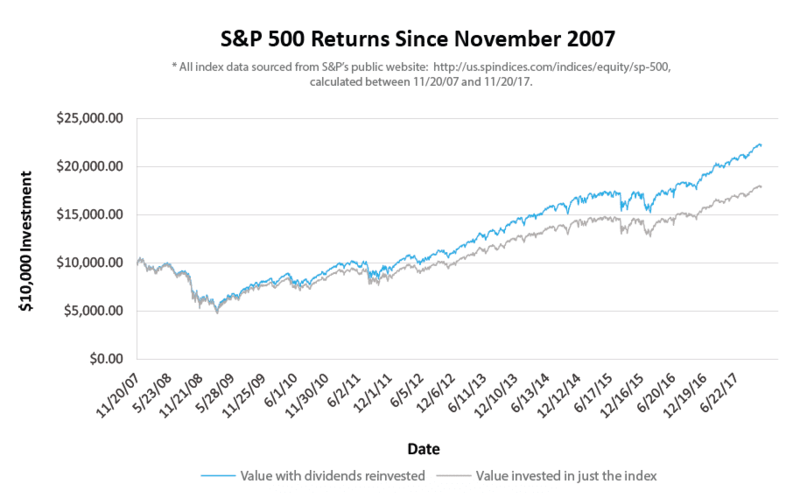 We all know about the most common benefit of diversification: smoothing out risk (to be specific, unsystematic risk) which leads to maximized returns. 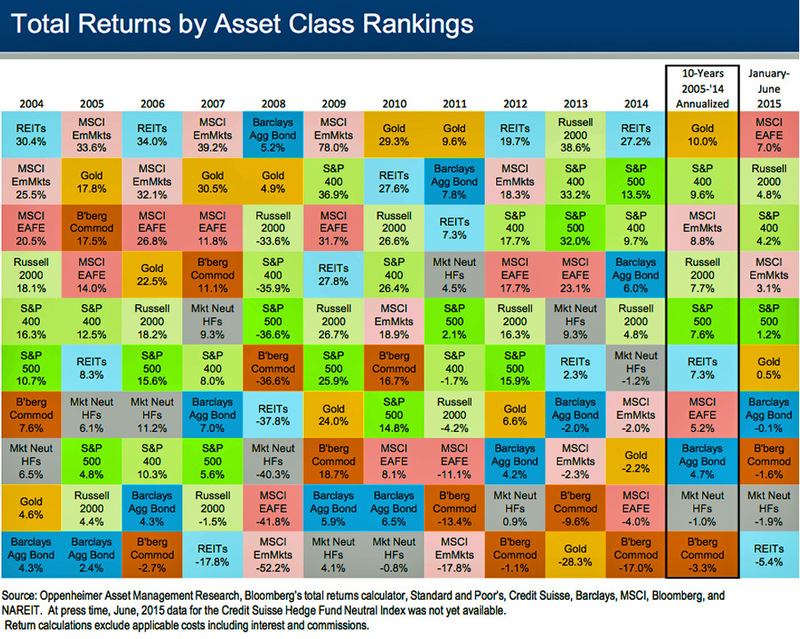 There’s another underrated benefit of true diversification though: it corrects for our natural biases. As Carl Sagan once said, “Human beings have a demonstrated talent for self-deceptions when their emotions are stirred.” It’s usually that which we know best that gets us most excited. We invest in the stocks of companies we know and understand, but those are usually in the same industry in which we work. Often, it’s believing in your own company and putting your retirement account mostly in the same stock. 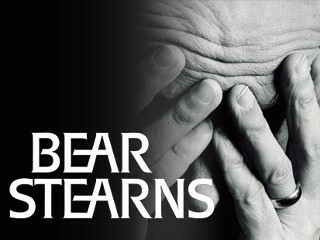 I began my career at Bear Stearns, the first investment bank to collapse in the Great Recession in 2008. I can’t tell you how many senior bankers there lost everything, as they had invested their savings in Bear stock in the belief that they knew the company better than any other and believed it was solid. We go on real estate crowdfunding platforms to invest in a variety of properties, yet most people have a bias towards deals in their same city/region where they are often already a homeowner. Trophy geographies like Santa Monica and the Hamptons can elicit Sagan’s aforementioned emotions for investors around the world. For most zip codes though on crowdfunding platforms, you’ll find locals disproportionately investing. So here is my challenge to you: As you think about your 2016 investment strategies, start by identifying your biases. Have you only invested in places around the country where you thought you yourself would live? Limited your portfolio to places you’ve actually visited yourself? (I remember one investor who has a superstition about not investing in properties whose street started with a vowel…but she did surprisingly well!) Did you stay out of certain cities or states because of how you imagine it or its residents to be, without actually knowing? Avoided sponsors under or over a particular age? I did this same exercise at the beginning of the year, and found I’d had a bias against Class B apartment building investments. My unverified assumption was that their pop is limited by an inability to go to Class A if they’re too old while also missing the upgrade opportunities in a Class C building. I’m digging in to verify or dismiss this bias. 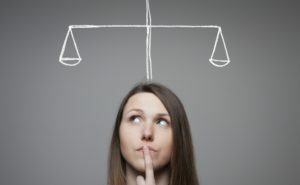 What are some of your investment biases? I’d love to hear about them! As always, you can reach me at Ray@alphaflow.com. If you enjoyed this post, sharing it on Facebook, LinkedIn or Twitter with the links below is the highest form of flattery. Thank you!